Song is musical trill on one pitch. Also gives rapid buzzy twittering in flight. 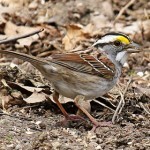 Description: Variable plumage. Most (“Slate-colored”) have a dark slate gray head, upper breast, flanks, and upperparts; contrasting white belly and lower breast. In all forms, white outer tail feathers are conspicuous in flight. Female is similar but is brownish-gray instead of slate gray. Male of the “Oregon” race has blackish hood, reddish-brown back, and buffy-orange sides. Female is duller overall. 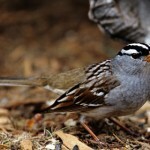 The “white-winged” race that breeds in the Black Hills has blue-gray head, breast, and upperparts; white belly; two white wing barsl; and is a regular breeder in the Pine Ridge. Habitat: Found in a variety of habitats including woodlands, suburbs, and residential areas. Often seen foraging on the ground underneath feeding stations. 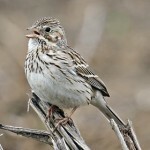 Where in Nebraska: Common spring and fall migrant and winter visitor across the state. Local summer resident in the Pine Ridge area. Field Notes: “Gray-headed” race is an irregular and occasional winter visitor in eastern Nebraska, including Lincoln, Webster, Adams, and Lancaster Counties. 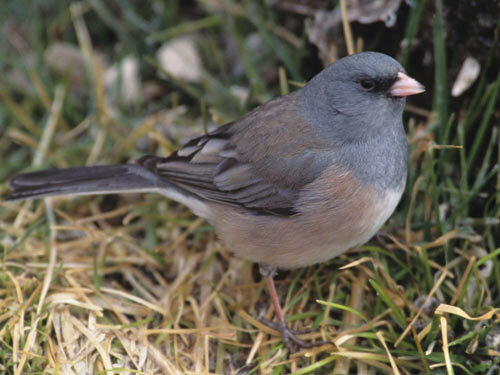 Fun Facts: The Dark-eyed Junco is one of the most common birds in North America. A recent estimate set the junco’s total population at approximately 630 million individuals! !